It’s been awhile! My leg is still broken, but I’m not letting that stop me. I’ve been keeping busy with lots of projects. Here are some pictures of just a few of them. 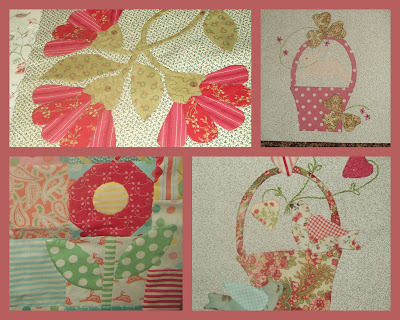 The baskets are part of the Bunny Hill applique Block of the Month series. Aren’t they darling?! I’ve also been working on the Kansas City Star Block of the Month. (top left) The picture on the bottom left is a new charm pack pattern we got in called “Poppy Day” by Pieces from my Heart. I made mine with a Sweet by Urban Chiks charm pack.